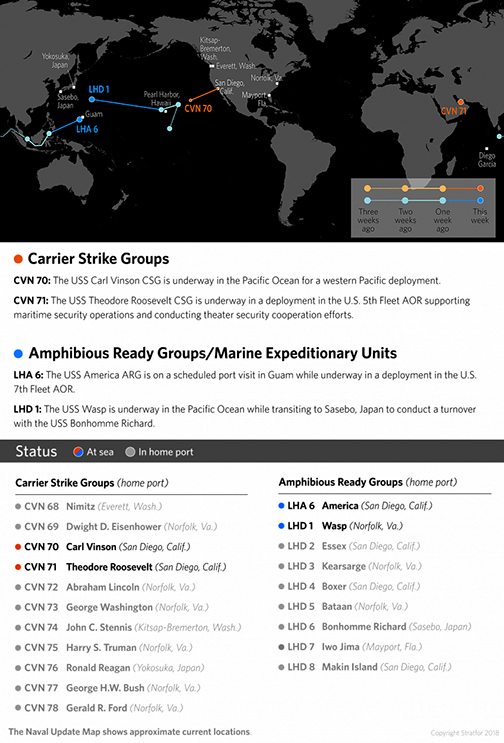 The below Naval Update Map shows the approximate current locations of U.S. Carrier Strike Groups and Amphibious Ready Groups, based on available open-source information. All information contained herein is unclassified material. No classified or operationally sensitive information is included in this weekly update. CSGs and ARGs are the keys to U.S. dominance over the world's oceans. 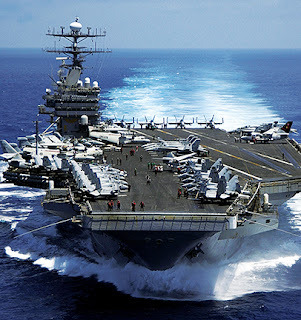 A CSG is centered on an aircraft carrier, which projects U.S. naval and air power and supports a Carrier Air Wing, or CVW. The CSG includes significant offensive strike capability. An ARG is centered on three amphibious warfare ships, with a Marine Expeditionary Unit embarked. The USS Theodore Roosevelt CSG is underway in a deployment in the U.S. 5th Fleet area of responsibility supporting maritime security operations and conducting theater security cooperation efforts. The USS Carl Vinson CSG is underway in the Pacific Ocean for a western Pacific deployment. The USS America ARG is on a scheduled port visit in Guam while underway in a deployment in the U.S. 7th Fleet area of responsibility. The USS Wasp is underway in the Pacific Ocean while transiting to Sasebo, Japan, to conduct a turnover with the USS Bonhomme Richard.